Posted 02/23/2015 by Richard Savery & filed under News. This month we spoke with Peter McConnell about his work on the remastered score for Grim Fandango. 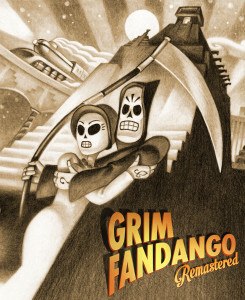 Initially released in 1998, Grim Fandango received widespread acclaim and is commonly listed as having one of the best game soundtracks of all time. It has now been remastered and released to a new audience, featuring an updated score. 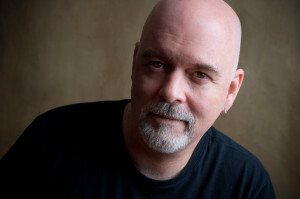 Outside of Grim Fandango, Peter McConnell has worked on an array of titles including Broken Age, Hearthstone: Heroes of Warcraft, Plants vs. Zombies: Garden Warfare, the Sly Cooper series, Star Wars: The Old Republic, Psychonauts, and Brutal Legend. RS: Grim Fandango has a reputation for having one of the best gaming soundtracks of all time. How did it feel to go back and revisit the original music (even though it was your own)? PM: It was a gift, a real treat. I had always been happy with the score, but not with some of the sounds we had to use in the original release. It’s not often that you get a chance to re-do something the way you always wanted to. More live parts, no bad-sounding samples and – best of all – live tracks by the Melbourne Symphony Orchestra – what more could you ask for? RS: I understand a big part of the remastering was replacing the samples with real instruments and some of the music was remixed? What was that process like and what else was changed? PM: It was a huge effort, starting with the most basic task of obtaining the original data. All of the music tracks were on DLT backup tapes that had been tucked away in the LucasArts/Disney archives. I am grateful to Rob Cowles for saving these assets while LucasArts was transitioning to Disney ownership, to Derek Williams for finding them afterwards, and to Jory Prum for pulling off the incredible technical feat of retrieving the data, which required things like an old Mac with a SCSI drive. The entire process of tracking down and then extracting the data took a couple of months at least. Then there was the re-working of the score, which took three teams: the audio team at Sony who recorded live tracks and remixed 45 minutes of jazz tunes; the team at Pyramind in San Francisco who replaced old samples with better sounds in another 45 minutes of music and re-mixed all of the cut scenes in 6 languages; and the Melbourne Symphony Orchestra, recording about a half hour of orchestral music. Special thanks go to orchestrator Karim Elmahmoudi, to Jory Prum again, who did the orchestral mixes, and to Camden Stoddard at Double Fine Productions who put in a heroic amount of work at the end, mixing music with ambient sound effects for in-game play. Add in about 800 hours of my own efforts in arranging, sample replacement, prepping for orchestration, mixing and reviewing the music, and the result was well over 2 hours of music that we completely overhauled – not to mention the 45 minutes of music we had already recorded live in the original version. All in all it was one heck of a process to plan, manage and execute, and I am super proud of what we were able to do. RS: In terms of music (and in general) what do you think made Grim Fandango such a success? PM: First, I think Grim came at the perfect time: the swing revival was taking off in those days with bands like Big Bad Voodoo Daddy and Squirrel Nut Zippers, and The Day of the Dead was just entering pop culture. In the Mission District in San Francisco, you could go to a club like Bruno’s and hear hot new swing bands like The Red Hot Skillet Lickers mix original sounds with old standards, then duck around the corner to a taqueria and hear a mariachi band play, and on the Day of the Dead there would be a huge parade at night. Almost every musician in the original Grim Fandango score, from the brass to the mariachi players to the Peruvian flutist, played in or came from the Mission District. All that said, these were just environment and influences. If you want to know whey Grim Fandango was and is a success, you have to somehow go into the mind of Tim Schafer. In the end, it’s all about his vision, story, characters and writing. RS: Where did the inspiration for the score come from? How much overall direction where you given from Tim Schafer? And how much direction for the remastered version? PM: Very early on in the process Tim handed me black and white concept art of the characters, his collection of Bogie movies, and some vinyl records of a particular kind of Mexican folk music called Son. It was very raw, using crude folk instruments: violins, charangos and hand percussion. I listened to that and watched the Bogie movies over and over, and even got copies of scores from Treasure of the Sierra Madre and Casablanca from the Warner archives. I had also been a fan of Duke Ellington since college, and he was a huge influence. I had a head shot of him in what looked like his early twenties above my computer screen in my office studio at LucasArts. Beyond the listening material, Tim didn’t give a lot of direction. In my experience, Tim leads more by inspiring than by directing. For the Re-mastered version he had very little input at all, except that he was very supportive of the effort to make the music the highest quality possible. RS: The original was released 17 years ago, how much have you changed as a composer since then? Do you think if you were scoring it from scratch you would use the same approach? PM: Hopefully I’ve gotten better – more skillful, more in control of the mood I want to create, more willing to take a risk. One of the great blessings of being able to re-visit Grim was to be able to fix a few things that had bugged me, the occasional klunker, or ham-fisted move. But those fixes were pretty rare. The pleasant surprise in the process was how well much of the original material held up. If I were to start again from scratch I hope I would use exactly the same approach – with the possible exception of how I handled the crazy tempo changes I never thought a real orchestra would have to play. Some of those pieces were just played live into a sequencer without regard for bar lines. That part I would do differently now, but overall, I think I would hit it pretty much the same way. RS: How did you come to record with the Melbourne Symphony Orchestra? What was the process like working with them? PM: The connection first happened when Andrew Pogson, their Special Projects Manager, called me early in 2013 about doing a pops concert performance of – of all things – Grim Fandango. In the course of working that out, it turned out that he was a backer for Broken Age and after a great deal of discussion and hard work we were able to get MSO to record Broken Age, which was MSO’s first game score. After that Grim seemed like a logical next step. I can’t say enough about how great MSO is to work with. The level of musicianship and focus and care for the music is simply outstanding. And I think we work very well together as a team. Going back to my early days at LucasArts I can say that there is nothing so valuable has having a great team. RS: Any final advice for GANG members? PM: There are as many ways to succeed in this business as there are people who have succeeded. Find where your strengths intersect with what resonates – for gamers, for developers and publishers – and build on those strengths. And try to get work inside a game company or big production house before you try to get work independently.